Can you survive the onslaught? Prehistoric terror comes to VR in the latest installment from the Primal Carnage universe! Slice, shoot, and blast your way through hordes of predatory reptiles as you make your way back to the top of the food chain! Have you got what it takes? The onslaught is here… survive or be eaten! All of your favorites from the trusty hunting knife through to the reptile wrecking grenade launcher. Channel your ‘inner commando’ by dual wielding your favourite weapons! Stand your ground in a variety of rich, detailed environments, from high-tech cloning labs to lush forests and abandoned supply facilities. 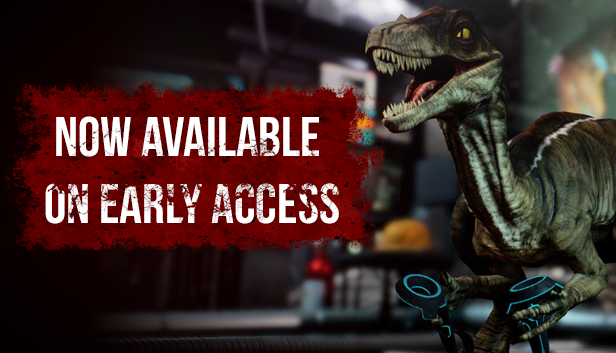 Take on the likes of pouncing Raptors, spitting Dilos, ankle-biting Compys, and more! Each species has its own unique AI, and all of them want you dead. Check out the Primal Carnage: Onslaught press kit here!